The Teen Economists: 'Gun Control' - Does it work? 11 dead. 10 dead. 26 dead. 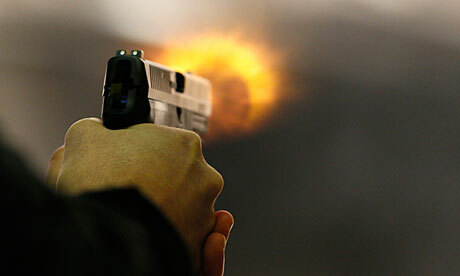 Every year, over 250 mass-shootings take place in the United States, making an average of almost once per day. In the wake of so many mass-shootings: Fort Hood, the Aurora theater, Sandy Hook Elementary School, and most recently the shooting at the navy yard in Washington, D.C., and finally, the shooting of 13 people in a Chicago basketball court, which included a three-year-old child among the victims, many people not only in the United States, but around the world, are having a serious debate about the merits - or lack thereof - of gun control. Many people believe there is no connection between gun control and the rate of violence in a country. For instance, Republican Representative John McCain believes that there is no connection between guns and violence at all. He, along with many other conservatives, persistently speaks out against gun-control laws, attempting to block almost all progress. So let's start out by having some fun and tearing his statement to pieces. First of all, here are a few basic facts; in just 2008, the US had over 31,000 deaths related to firearms, accounting for at least 10.5 people per 100,000. Not overall deaths, JUST firearm deaths. In the US, buying guns is incredibly simple. Private sales are completely legal, and almost anyone can walk into a gun show and buy one, regardless of mental health condition or if you have a past of violent behavior. But hey, I'm sure that the almost non-existent gun-control laws have nothing to do with such a high firearm death rate, right? I'm sure the fact that firearms are being marketed specifically for youth doesn't matter at all. After all, I'm certain we've all heard countless stories about drive-by stabbings. Meanwhile, across the world in Japan, there must also be a tragic amount of gun deaths, right? Not exactly. Japan has actually instituted gun control legislation. Has it worked? I'll give you the numbers and let you decide for yourself. How many firearm-related deaths did they have, you ask? In 2008, the same year over 31,000 Americans died due to firearms, Japan had a meager 582 deaths, about 0.5 people per 100,000. With some quick math, that tells us that America has 54 times as many firearm-related deaths as Japan. And yet so many Conservatives cry and scream about how implementing gun control legislation won't change a thing. Neither will banning domestic assault weapons. Neither will banning high-capacity magazine cartridges. Because obviously an AR-15 with a magazine that can hold 35 bullets is a FUNDAMENTAL need in order to go out hunting, right? Some people argue that gun control laws don't do anything to stop criminals, only to disarm law-abiding citizens. Gun control legislation, in most cases, is not meant to disarm anyone. Most times, the legislation pushes for much stricter background checks on people who want to buy an gun, to make it much more difficult for people thinking of committing violent acts with these weapons to get their hands on them in the first place. So why, even after tragedy after tragedy, after so many innocent lives are taken unexpectedly, why are we still having a debate about something we know will help save lives? That's what I want to know the answer to. The rest of the developed world has already progressed past this issue. Now it's basically just the US that is still debating it. Americans are often fond of saying that they're 'Number One'. It's true, they are number one, but in all of the wrong categories.